Sleeve notes in English and Finnish. 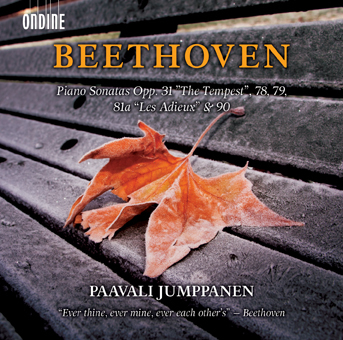 This double-CD release is a fourth volume in pianist Paavali Jumppanen’s ongoing recording cycle of the Beethoven piano sonatas. This release includes Piano Sonatas Nos. 16–18 & 24–27 – written between 1801–02 and 1809–14, and belonging to the middle period of the composer’s oeuvre. Jumppanen’s first instalment in the Beethoven cycle received thrilling reviews and, among others, the ‘Choc’ Award from the French music magazine Classica.